Professor, A. B. Shetty Dental College, Nitte University. Mangalore, India 575018. Dean, A.B.Shetty Dental College, Mangalore, India 575018. Member, Society of Oral and Maxillofacial Surgeons of India. Reader, Government Dental College, Bangalore, India. Professor, K. .S..Hegde Medical Academy, Nitte University, Mangalore, India. Post Graduate Resident, A.B.Shetty Dental College, Mangalore, India-575018. Materials and methodology: 90 subjects (45 males and 45 females) aged between 18 and 30 years were selected as per inclusion criteria and were grouped as Group I. Individuals with normal class I relationship, Group II. With maxillary deficiency and Group III. With mandibular excess. Analyses of dentofacial characteristics of selected individuals were done using Grummon's analysis in Frontal cephalograms. The data obtained was statistically analyzed using Paired T test. Results and conclusions: Facial asymmetry exists between right and left sides in skeletal class III individuals. The mandible is found to be more asymmetric than maxilla in patients with maxillary deficiency. Keywords: Dento-facial characteristics, Facial symmetry, P A Cephalometrics, Skeletal Class III, Transverse plane. Class III skeletal malocclusion though primarily a sagittal jaw discrepancy, it would be interesting to study the skeletal features in transverse plane also. It is therefore essential to evaluate the skeletal relationship in all three planes of space. 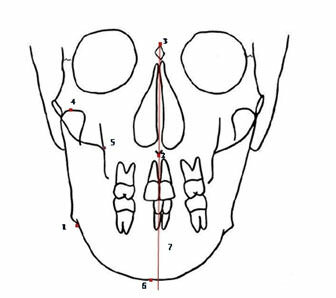 Hence this study was designed and conducted with the objective of assessment of facial asymmetry in transverse plane in individuals having skeletal class III jaw discrepancy. 90 subjects (45 males and 45 females) between 18 and 30 years of age were selected as per the following criteria. The subjects for the control group were selected based on their pleasing class I profile, normal dental occlusion with normal overjet and overbite with no midline deviations. Written informed consent was obtained from each individuals and the project was approved by the Institutional Review Committee. Lateral cephalograms were made and the subjects were classified based on their sagittal relationship as follows. Postero-Anterior (P-A) cephalograms were made for all the selected subjects under standardized conditions and were traced on 0.03 acetate paper using 2H pencil by a single operator. Anterior nasal spine (ANS)- The most anterior point on the maxilla at the level of the palate. Crista Galli (Cg) - Neck of Crista galli. Condylion (Co) -The most posterior superior point on the condyle of the mandible. Jugal process (J) -Medial aspects of the jugal process. Menton (Me)- The most inferior point on the symphysis of the mandible, as seen on the lateral jaw projection. Gonion (Go)- The point on the contour of the mandible determined by bisecting the angle formed by the mandibular and ramal planes. Mid Sagittal Reference Line (MSR) -Vertically fom Cg through ANS to the chin area. Left - right triangles are formed from the heads of the condylar processes or condylion (Co), Antegonial notch (Ag) and Menton (Me). These are split by ANS-Me line and compared. Two volumes are calculated from the area defined by each Co-Ag-Me and the intersection with a perpendicular from Co-MSR. Perpendiculars are drawn to MSR from J and Ag and connecting lines from Cg-to J and Ag. This produces 2 pairs of triangles, each is bisected by MSR. The linear distance is measured from MSR to Co, J, Ag and Me. The mean and standard deviation for each measurement was calculated. Paired t-test was used to test the significance (p= 0.01 or less) in the difference between the right and left sides of the face and for any gender difference. The facial symmetry of skeletal class III individuals was analyzed using Grummon's analysis in a frontal cephalogram and the following results were obtained. Statistically significant differences were observed between right and left side values in relation to Ag-MSR in females of group II individuals. No significant differences were observed between right side and left side values in relation to Cg-J, Cg-Ag, J-MSR Group I Group II and Group III. Hence this study was planned and designed for the assessment of skeletal symmetry in skeletal class III individuals. The data obtained would give us an insight into the skeletal relationships in the transverse plane in these individuals. In the present study the following components of Grummon's analysis were used - Mandibular Morphology, Volumetric Comparison, Maxillo-Mandibular Comparison of asymmetry, Linear asymmetry assessment and Maxillo-Mandibular relation. Individuals in the age group of 18 years to30 years were selected as per the inclusion criteria and exclusion criteria. Lateral cephalogram, frontal cephalogram and were taken after obtaining the written consent. 30 individuals (15 males and 15 females) with maxillary deficiency and 30 individuals (15 males and 15 females) with mandibular were considered for the study. 10 cephalometric measurements were made to determine and evaluate the dentoskeletal characteristics in transverse plane in skeletal class III malocclusion. The mean and standard deviation for each measurement was calculated. Paired t-test was used to test the significance in the difference between the right and left sides of the face and for any gender difference. Statistically significant differences were observed in relation to Ag-MSR in females having maxillary deficiency. No significant difference was observed between right side and left side values in relation to Cg-J, Cg-Ag, J-MSR in all three groups of individuals. This finding is in agreement with studies by Rossi M & al,(2003) 8 Haraguchi & al,(2002) 9 and Server TR and Profit, (1997)10 but is in contradiction to studies by Shah and Joshi,(1991)11 according to which there is a tendency for the maxilla to be more asymmetric than mandible. Statistically significant differences were observed in relation to MSR-Co in males and MSR-Ag in females having maxillary deficiency. No significant differences were observed between right side and left side values in relation to MSR -J, MSR-Me in all groups of individuals. In the present study, consistent left side dominance has been found in all cephalometric measurements both in males and females. . This finding is similar to a study done by Giovanoli & al,(2003)12 who had reported left sided dominance. However, Haraguchi& al,(2002)9 Shah and Joshi,(1978)11 Peck & al,(1991)7 in their asymmetry analysis, reported a right side dominance. The present study revealed significant skeletal asymmetry in transverse plane in individuals with skeletal class III malocclusion. This fact must be taken into account during diagnosis and treatment planning. Further studies with larger sample size comprising of different skeletal and dental malocclusions in various racial groups at different age groups will be required for assessment of skeletal and dental asymmetries. Variations in facial symmetry were evident between the right and left sides in individuals with skeletal class III malocclusion. The mandible is found to be more asymmetric than maxilla in patients with maxillary deficiency. Volumetric comparison showed male dominance in individuals with maxillary deficiency and maxilla-mandibular relation showed female dominance in maxillary deficiency group. Dawn M.Wagner and Chun-Hsi Chung (2005). Transverse growth of the maxilla and mandible in untreated girls with low, average, and high MP-SN angles: A Longitudinal study. Am J Orthod Dentofacial Orthop; 128:716-723. Samir E.Bishara, Pauls.Burkey, JohnG.Kharouf(1994). 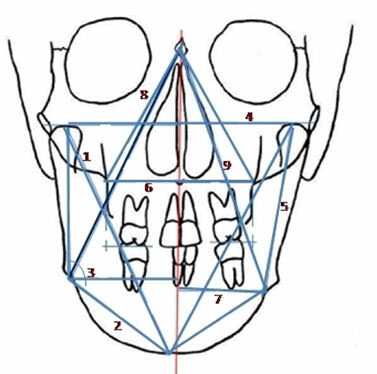 Dental and facial asymmetries: A review. Angle Orthod; 64(2):89-98. Peck, Leena Peck, Matti Kataja (1991). Skeletal asymmetry in esthetically pleasing faces Sheldon. Angle Orthod; No. 1: 43 - 48. Shah SM. Joshi MR (1978). An assessment of asymmetry in the normal craniofacial complex. Angle Orthod; 48(2):141-48. Giovanoli.p, Tzou CHU, PionerM (2003). Three dimensional video analysis of facial movements in health volunteers, Br.J plast Surg, 56:644.